A roll-top bath is a design classic that can transform any bathroom. A standalone statement piece that is an invitation to luxuriate in a long soak. The appeal of the roll-top has endured since the 1800s when they were a symbol of wealth and status, displayed in the middle of the bathroom. Although it has a long heritage, the roll-top is surprisingly versatile style. Claw feet can match a period scheme or chosen colour; shimmering metallic sides can set off a contemporary suite or be the centrepiece of an industrial look; charming slipper baths mean you can have a tub in the most compact bathroom. However, when it comes to material choices, you now have far more options than the classic choice of cast-iron. Read on to find out what is on offer and what the benefits of each. Pros: Durable and versatile, they can be moulded into different shapes and come in different colours. Being lightweight acrylic baths are easy to install yet they retain heat well. Acrylic tends to be the most affordable option. Cons: They scratch if abrasive cleaners are used. Polymer baths can deform and you have to be wary of cheaper baths which are not robust. Pros: A design classic, cast iron is extremely durable and options with thicker enamel are far more resistant to chips. It can be slow to heat but once hot will retain it well. Cons: It is the heaviest of materials, making it more of a challenge to install. A six-foot-long bath can weigh as much as 200kg, even before it has been filled with water. This means the floor might need reinforcing to support it, adding an extra cost. Pros: Considered lightweight in comparison to cast-iron, porcelain-enamelled steel is durable and affordable. Cons: Steel conducts heat so the water cools quickly. This material can chip easily and is much heavier than the likes of acrylic. Pros: A good way to get the look of pricey natural materials, cast polymer baths come in a good choice of colours. Cons: This option is more expensive than acrylics. The gel can become brittle and lead to cracking. Albion baths are made from a special Iso-Enamel, a material created by the company themselves. 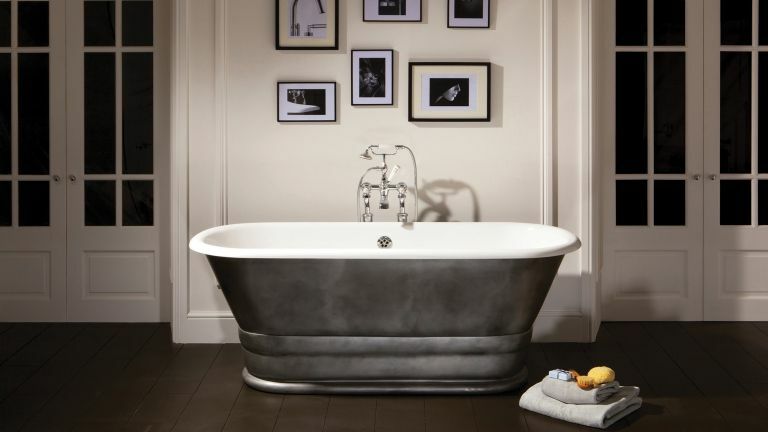 An amalgamation of high-tech resin and a special reinforced mineral, it is cast in moulds and allowed to harden, resulting in a strong and durable bath with a luxury feel. The benefits are that it is only a third of the weight of cast iron, so there is no need to reinforce the floor. The Iso-Enamel also acts as an insulator, keeping the water hot for longer – perfect for long soaks. It can be cleaned with a modern liquid cleaner, and if it gets scuffed can easily be polished back to a high shine.